When one of Brisbane's best meccas for international labels rolls out its first e- commerce venture, it's time to stand up, move to your laptop, and begin putting together wishlists, ladies! The incomparable camargue boutique, a mainstay on Brisbane's high fashion circuit for the last 35 years, has just swung open the virtual doors to its online store. The new venture wraps up the heritage of the boutique, and its unrivaled roster of designers, into a neat little package that will leave lovers of fine things salivating at their laptop screens. As if the Good Deal Gods were smiling down at us; the store is jammed pack with some serious sale steals. And when I say steals, I mean it literally; $1475 Haider Ackermann brocade jackets are walking themselves out the door at $200 a pop. Now that's what I call excellent buying. Thankfully, you can now enjoy these bargains from the comfort of your bed at home. PJs and a cup of tea optional, but recommended. Here are our top picks from camargue's end of season sale. 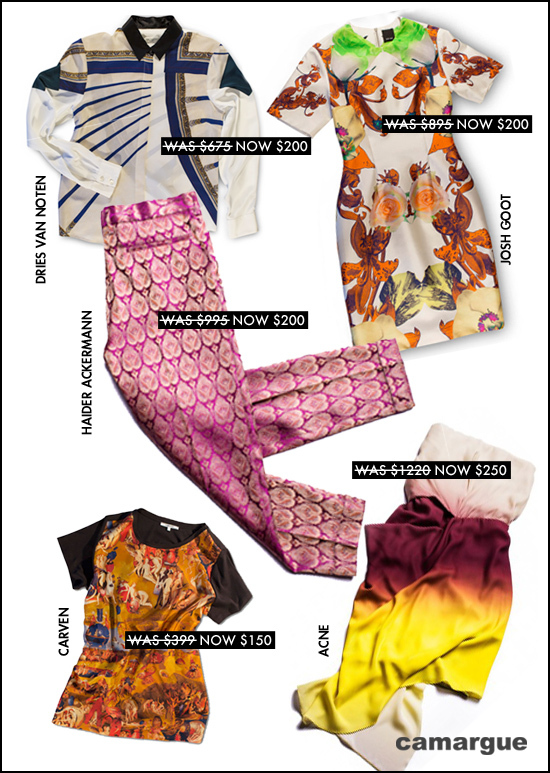 Dries Van Noten Blouse, Josh Goot Dress, Haider Ackermann Pants, Carven T-Shirt, Acne Dress. Today's List Love post is proudly sponsored by camargue and endorsed by The Urban List. Our sponsored posts will never be a secret - the List Love seal will be stamped on any sponsored material you see on the site.